This major new solo show by international artist Anna Dumitriu blurs the boundaries between art, textile crafts and science. It will feature: a dress patterned using pigments from environmental bacteria and antibiotic embroidery; a large-scale collaborative crochet based on the bacteria from the artist’s own bed; an indigo blue coloured patchwork stained with MRSA bacteria grown on chromogenic agar and patterned with clinical antibiotics and other tools in the research and treatment of this disease; a Whitework embroidered lab coat patterned with images of bacteria and moulds found on it; and a new series of works about the emerging field of bacterial communication (in collaboration with Dr Simon Park and funded by The Wellcome Trust). All the works, made in collaboration with scientific experts, have been made sterile prior to exhibition. Normal Flora is the name given to the ubiquitous microbes that we co-exist with in our everyday lives. The newly created video projection made in collaboration with international artist Alex May and microbiologist Dr John Paul – The Art and Science of Linen – looks at the whole ecology of linen from the bacteria used to break down the flax in retting tanks to the industrial production of linen and its cultural importance. It will focus strongly on incorporating images and textures of antique linen textiles, flax flowers, linen production methods (rural and industrial) and the beneficial microbes that help in its production. Dumitriu will use similar techniques to previous textile works, incorporating experiments specifically undertaken in preparation for her solo show. Talk by the artist at R-Space on Saturday 30th July at 3.00pm. 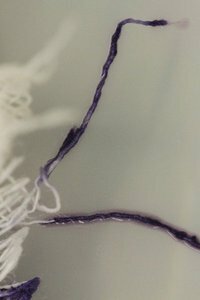 ‘Infective Textile Workshops’ at The Linen Centre/R-Space on Friday 29th July – check website for confirmation of times. ‘Anna Dumitriu: Normal Flora’ has been kindly supported by Lisburn City Council.